The Vernons, an Aussie blues rock n’ roll band, have released their new video for “Shake n Roll,” the track that inspired a nation-wide T-Mobile commercial! The track was released off their debut EP, Volume I, in the US on September 6th, 2013, produced by multi-award-winning engineer Yanto Browning (The Medics, The Jungle Giants, Kate Miller-Heidke). Volume I has garnered reviews from the likes of Guitar World, Zimbio, NYLON Guys, You, Me & Charlie, ARTISTdirect, etc. With a fresh, original sound, it’s impossible to ignore the group, and this minimalistic video only makes it more difficult! Fresh on the heels of their debut EP, the Vernons are gearing up to go into the studio with Louie Shelton to record their sophomore EP Volume II, which is set to be released in July. The band is comprised of Jonny Nyst (Lead Vocals/Rhythm Guitar), James Nikiforides (Lead Guitar/Backing Vocals), Hugh Tait (Bass Guitar/Backing Vocals), and Elliot Gooch (Drums/Backing Vocals). They have taken all that was great from the vinyl-age to craft a new sound since their conception in mid 2011, bringing a style that was all but forgotten back into prominence. Nyst’s vocals show subtle hints of inspiration from the greats, from the deep undertones reminiscent of the King of Rock himself, to the electrifying performance alongside the edgy instrumentals that bring comparisons to Billy Boy On Poison. From their humble beginnings on Queensland’s Gold Coast, the quartet quickly found themselves supporting names like Wolfmother & Seasick Steve, earning a spot at the 2013 Big Day Out local stage. 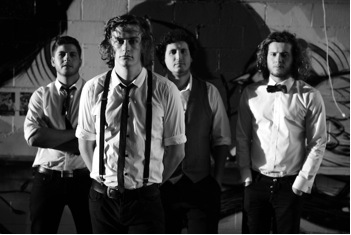 Following the release of their debut EP – Volume I, the Vernons recently made the No. 1 spot on the iTunes Blues charts with their single “Standing In Line”. The Vernons released their debut EP, Volume I, on September 6th, 2013. To purchase Volume I, please visit iTunes, here: http://bit.ly/1dZ7LQ5.